Now at Pinterest as Affordable US Beach Vacations -- Check out our "Cheap" US Beach Vacation Boards and Pins! These photos and captions were actually taken from a 15-state SE USA Road Trip Vacation my Wife and I took in June of 2007, but we decided next time we could drive part of the beautiful and peaceful Blue Ridge Parkway as a 3-day affordable "Add On" or overnight 2 or 3-day trip from a Vacation to Virginia Beach. 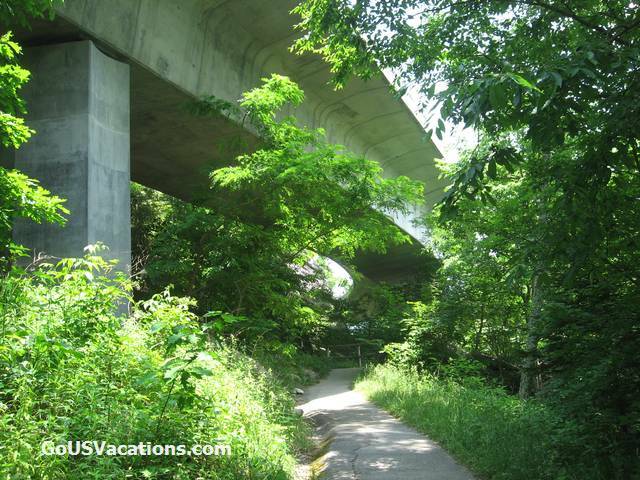 The Parkway is about a 3 1/2 hour drive from Virginia Beach to get on it near the town of Roanoke off of Hwy 460 from Richmond or to get off of the Parkway near the town of Waynesboro off of I-64 that goes through Richmond back to Virginia Beach at the end of the trip. This route would allow about 7 hours driving time on the Parkway allowing for fact that drivers usually only average about 25 MPH with all of the Scenic pulloffs and Visitor Center stops + the 45 MPH speed limit. Two days is really not enough to see all there is to see driving on this Educational and very Scenic Road Attraction. A Historic Blue Ridge Parkway Vacation Road Trip could actually start at at the southern end of the Blue Ridge Parkway at the Great Smoky Mountain National Park south of Asheville, NC, and include driving the entire length of the 469 Mile long Parkway north through North Carolina and Virginia to the northern end near Waynesboro, VA near I-64 from Richmond and Virginia Beach. 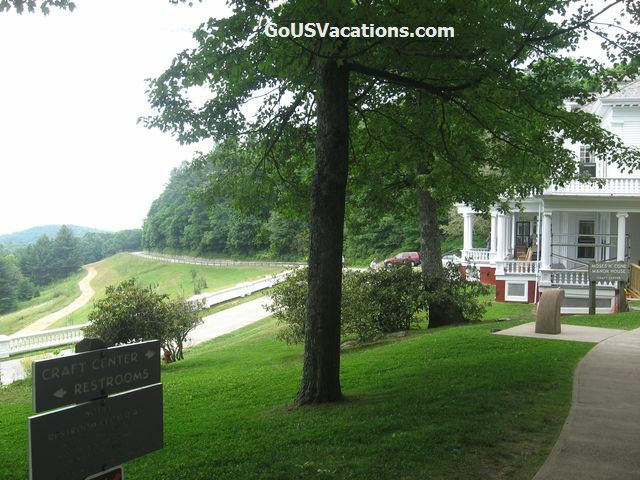 This full length trip would take a minimum of 3 days driving time on the Parkway if you took time to enjoy all of the Scenic Overlooks and Visitors Centers. Fall Blue Ridge Parkway Vacation - Photos and Tips - Our recent Fall driving tour on the very colorful Blue Ridge Parkway in mid October - a Fall Getaway Vacation or some cheap "Add on Days" to a Virginia Beach Vacation. Google Map Route for Blue Ridge Parkway Vacation (part of the I-64 route from Richmond southeast to Virginia Beach is cut off in this map image) - 2 day add on version from Virginia Beach. 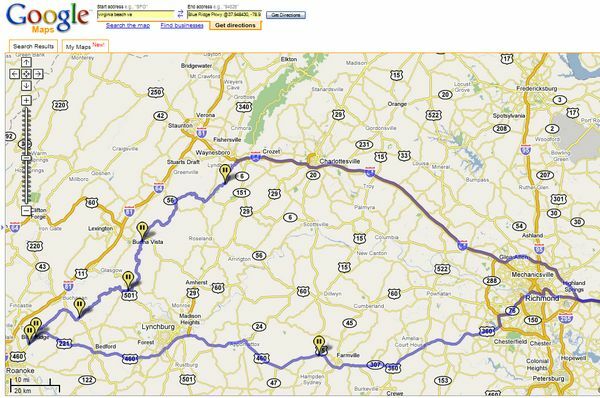 Get on Blue Ridge Parkway at south end of this driving route near Roanoak, VA -- Finish scenic Parkway drive and get off at northern end of Parkway near Wayensboro, VA. To Interactive Google Route Map above. Note the new Google feature that allows you to "drag" their suggested route from a highway or interstate over to the slower Blue Ridge Parkway map route. Tip - We and others we have talked to have only averaged about 25 MPH on the parkway with all of the stops and the low speed limit. It is a peaceful drive. 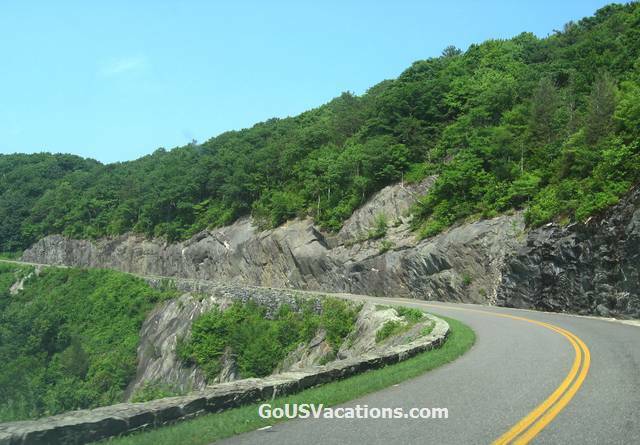 There are many great points of interest, scenic pull offs, parks, and Visitors Centers along the Blue Ridge Parkway, so allow at least twice as much time as you regularly would allow for the distance traveled for your driving time on the parkway. The speed limit on the Parkway is 45 MPH in most areas, and 35 MPH in some areas. The drive on the Blue Ridge Parkway is through some some very scenic forested mountain areas - you will see some beautiful Fall Foliage colors if you are considering that time of year. Actually don't think would recommend the Blue Ridge Parkway Drive as an activity that young kids will enjoy -- and thus the Parents will enjoy the scenic drive less when the kids start complaining about the long ride in the car. -- "Are we there yet?" 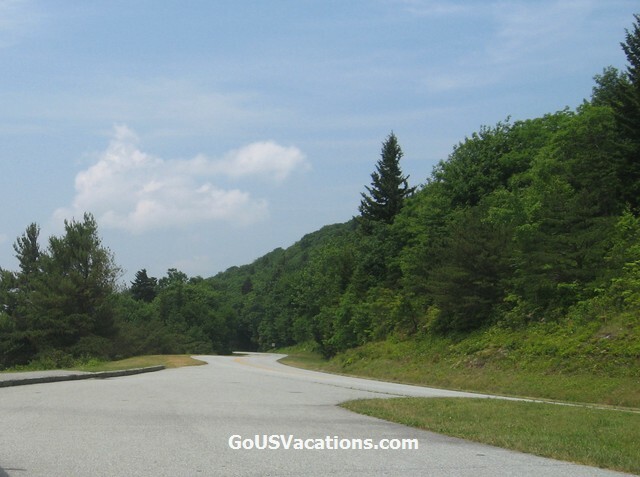 A few Pictures from our beautiful and peaceful mid June 2007 Blue Ridge Parkway Vacation drive are below so you can see why this is a "Must See" minimum 2 or 3 day trip or "add-on" trip for your Virginia Beach Vacation. We got on the Blue Ridge Parkway at the southern end of our drive near Blowing Rock, NC which is just east of Boone. This was the Parkway Craft Center Visitors Center in an old Mansion located in the Moses Cone Memorial Park along the Parkway near the interesting town of Blowing Rock. Carrol Gap Scenic Overlook. There were many Scenic Pulloffs along our Blue ridge Parkway Vacation route. Another Scenic Pulloff on the Blue Ridge Parkway. The Blue Ridge Parkway was constructed in the 1930's as a make work project during the depression. Add a few days to your Virginia Vacation or take a seperate fun mini-Vacation. See discounted, cheap, and free Getaway Vacation Lodging Packages on our new Timeshare Vacation Promotions page + direct Links to Vacation Getaway Discounts & Deals. Tip - Hold <Ctrl> key down when click a Link to open it in a new window - close to quickly return to where you were. 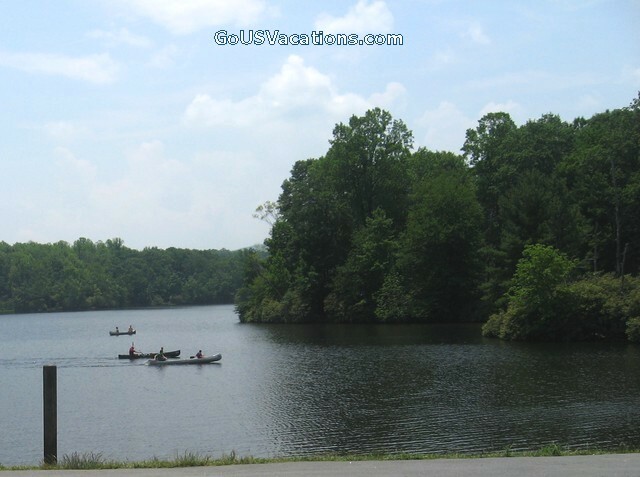 Canoes racing in Julian Price Park Lake next to Blue Ridge Parkway in the Julian Price Memorial Park. 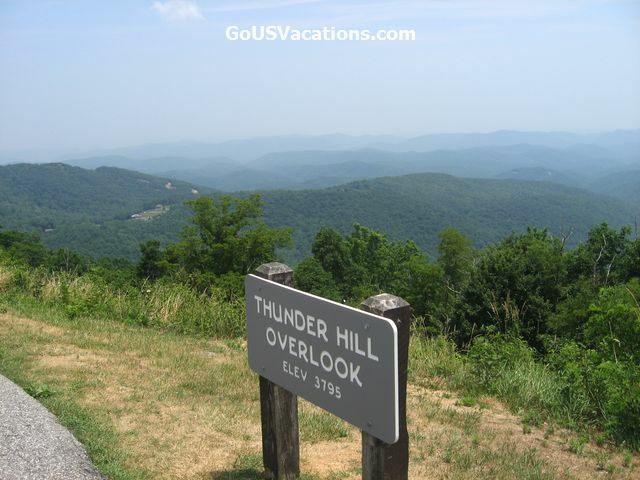 See this Blue Ridge Parkway National Park Service Web Site for more Info on the Parkway. The "Plan your Visit" page has much helpful information + links to other Info pages. This link goes to a page of Links to section strip Maps of the Blue Ridge Parkway you can view and print. View of Linn Cove Viaduct spanning boulder field from distance on Blue Ridge Parkway in North Carolina. on the road deck above to span the boulderfield. Quite an engineering feat. - Blue Ridge Parkway in North Carolina. Peaceful Valley Overlook from mountain on scenic pulloffs on Blue Ridge Parkway in North Carolina. Road cut in rocks going up mountain on Blue Ridge Parkway in North Carolina. Maximum speed on the limited access parkway is 45 so have time to enjoy the views. 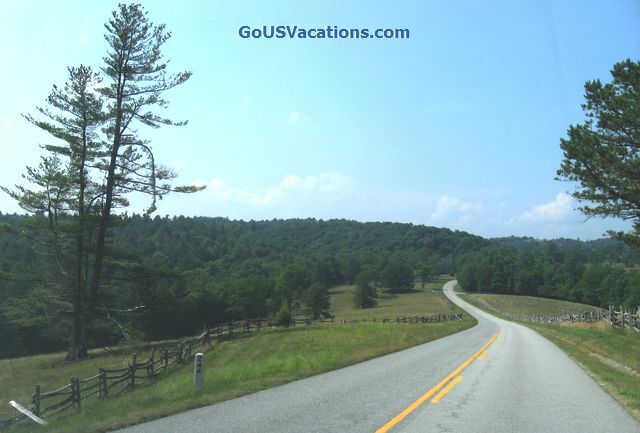 Can pull off almost everywhere for pictures on Parkway in NC or VA.
Parkway road through an area with split rail fences - Peaceful drive in Virginia area of our Blue Ridge Parkway Vacation. 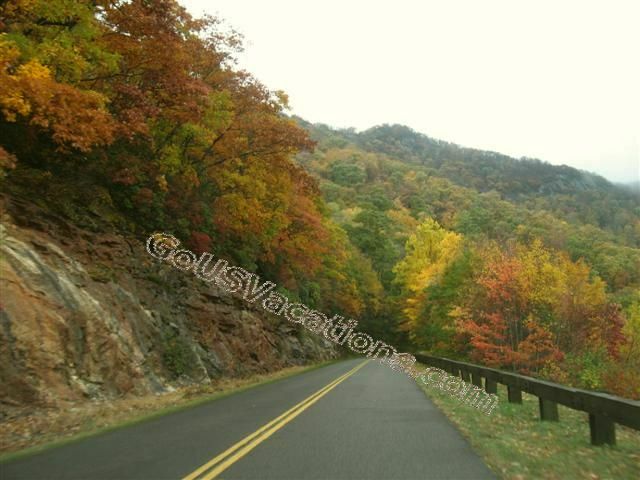 Fall Blue Ridge Parkway Vacation - Fall Photos and Tips - "Must See" Fall driving tour on the very colorful Fall Blue Ridge Parkway - a Fall Getaway Vacation or a few "Add on Days" to a Virginia Beach Vacation. We are adding Info, Pictures, and Tips somewhere on this Site almost daily. We are doing our best to ultimately make this site one of your most Interesting, Fun, and "Picture Enhanced" Blue Ridge Parkway Vacation and Virginia Beach Attraction Info and Tips Sources. We appreciate your suggestions or comments on our "Your Top Picks + Comments" Page. 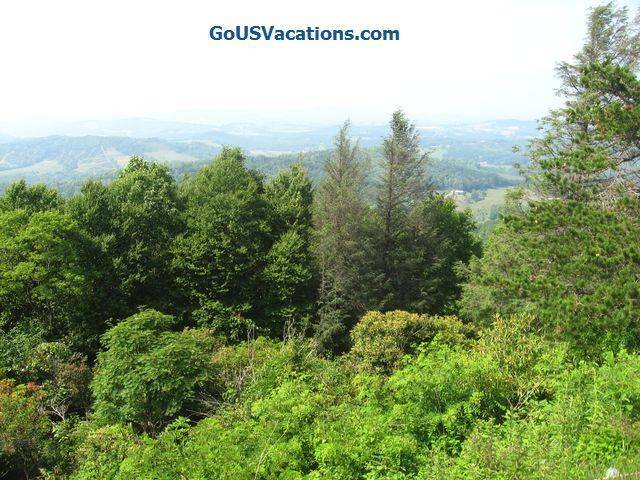 Comments on great Blue Ridge Parkway Vacation Lodging you have used. Local Points of interest, Attractions, and Blue Ridge Parkway Vacation Dining (Gene's big place of interest!) Restaurants you have particularly enjoyed would be of interest to all our "viewers." Send us Your Top Picks and Comments on our Gene Seecann Sites Comment Form Page. Thanks! 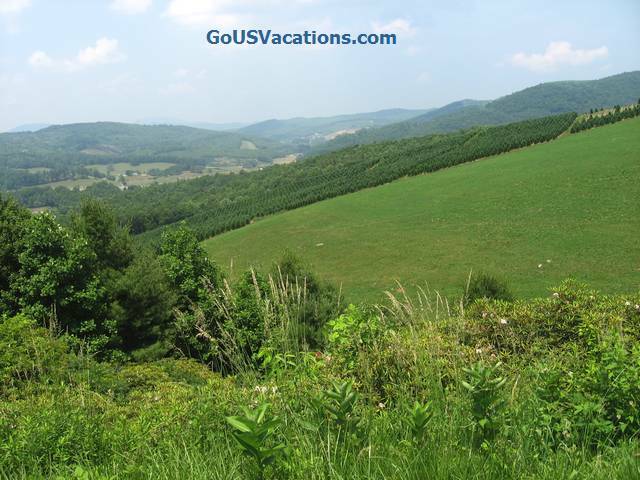 Add a few days to your Virginia Vacation or take a seperate affordable fun mini-Vacation. Check out the discounted, cheap, and free Getaway Vacation Lodging Packages on our new Timeshare Vacation Promotions page + direct Info Links to Vacation Getaway Discounts & Deals. To Road Trip Historical Vacations in the Southeast USA - Historic Battlefields, Parks, Buildings, and the Natchez Trace Parkway. To Road Trip Historical Vacations in the Eastern USA - Historic Lighthouses, Forts, and the Blue Ridge Parkway. 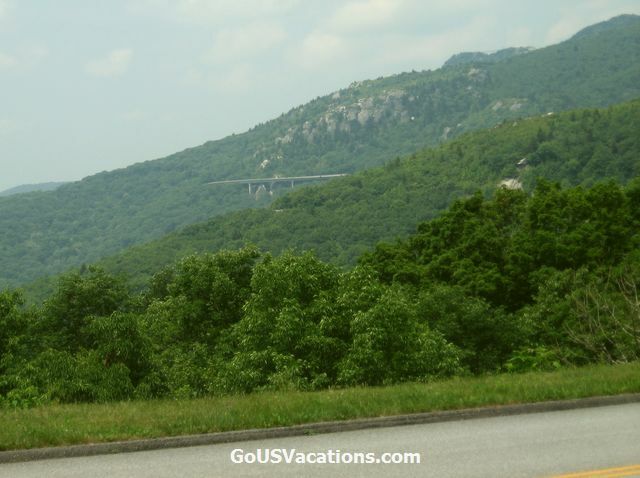 All Blue Ridge Parkway Vacation pictures on this page are Copyrighted but you are welcome to download and use them if the Watermark text remains visible on the image as it is here. Also see the High Resolution Downloadable Photo Link above. To Memorable Beach Vacations Home Page - Virginia vacation beaches travel tips and info + Nearby Virginia Beach Attraction Info, Pictures and Tips.